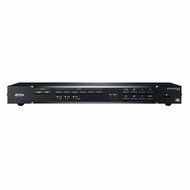 The ATEN VP1920 is a 3-in-1 presentation switch that integrates a video matrix switch, an audio processor, and analog-to-digital converter functions. With nine multi-format inputs to two HDMI 4K outputs, it is designed to boost the efficiency and impact of professional presentations. With streamlined control from front panel pushbuttons, IR remote controller, OSD, and RS-232, the VP1920 reduces not only system device count, but also lower operation complexity. It is suitable for all small-to-medium sized corporate and education presentation environments, such as meeting rooms, classrooms, training rooms, or any other presentation setting, such as in exhibition centers or hotels.